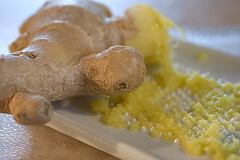 Skin fresh ginger and place in a small bowl cover with rosewater and soak overnight. Blanch almonds in 2 c boiling water and remove the skins. Put almond in a jar, cover with water and soak overnight. Discard the water in the almonds and grind into powder. Grate the ginger and add it to the almonds and continue grinding. 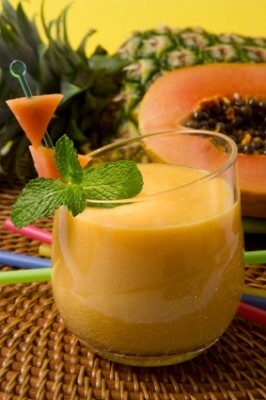 Add juice and grind until the mixture is creamy. Strain through a horse hair sieve to produce a thick creamy sauce. Add sugar and stir until dissolved. Place meat in soup bowls. Pour the sauce over it and garnish with sugar and cinnamon.